On Provincial and Vancouver District ProD Days. At General Gordon Elementary School, 2268 Bayswater St, Vancouver. Hands-on activities exploring forces, energy transformations and Newton's Laws. April 29th 2019 REGISTER. 15/18 spaces remain. On a topic and date to suit your school. Ingrid brings all materials to your school. $150/hr for a group of teachers. Workshop format: Try out low-cost teacher-tested activities that fuel curiosity and inquiry, and engage the diverse learners of the classroom. Documentation for each activity includes Science Curricular Competencies and Content connections, materials lists and links to a database of hundreds of science activities and lesson plans. 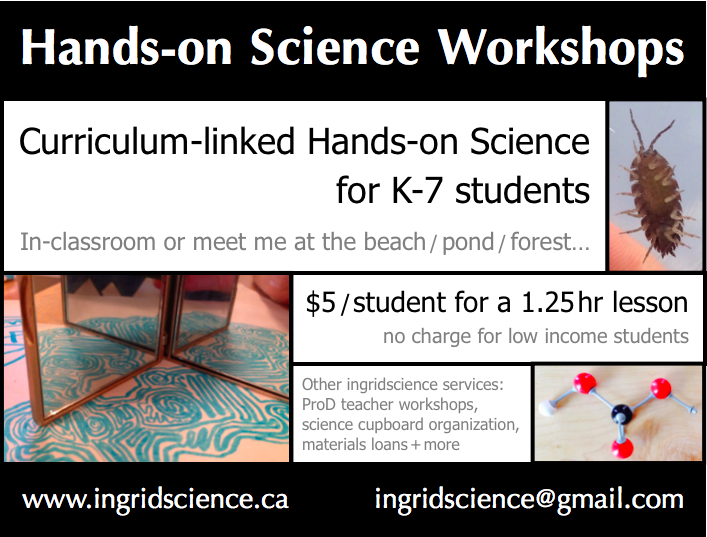 If you are looking to build your science activity collection, or are starting to bring hands-on science into your classroom, ingridscience workshops bring new ideas in an environment of discussion and sharing. 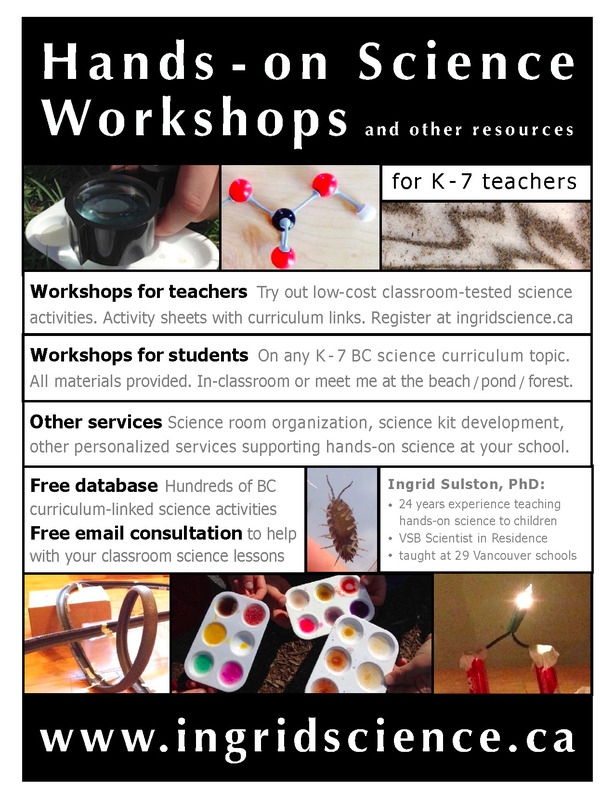 In-classroom or outdoor student workshops on any K-7 BC Curriculum science topic. Ingrid brings all materials. $5/student (no charge for low-income families). Outside of Vancouver, 2 or 3 workshops in one day preferred. Contact Ingrid with requests, or choose from these selections (pdf). Science room organization, science kit development, other personalized services that help you teach hands-on science. Free advice and suggestions always available via e-mail. Science room organization $35/hr. Other services a similar rate.